Heat oven to 400°F. Spray 15x10x1-inch baking pan with nonstick cooking spray. In shallow bowl, combine buttermilk, salt and ground red pepper; mix well. Place corn flake crumbs in another shallow bowl. Dip chicken in buttermilk mixture; coat with crumbs. 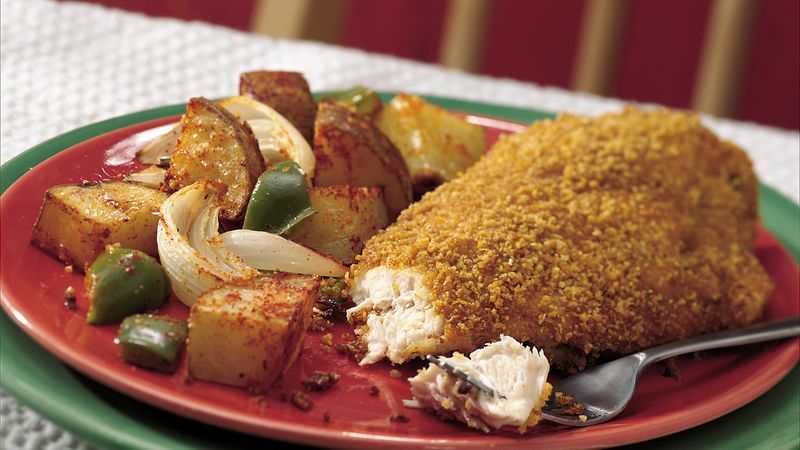 Place crumb-coated chicken breast halves in corners of sprayed pan. In large bowl, combine potatoes, bell pepper and onion. Sprinkle with cheese, garlic powder and paprika; toss to coat evenly. Place in center of baking pan. Drizzle butter over chicken and vegetables. Bake at 400°F. for 30 to 40 minutes or until chicken is fork-tender, its juices run clear and potatoes are tender, stirring vegetables once halfway through baking. Orange or yellow bell pepper can be substituted for red or green, or use any combination of colored peppers. Each serving of our oven-baked "fried" chicken contains about 20 less grams of fat than just one piece of typical take-out fried chicken breast. Accompany this one-dish meal with a crisp green salad and fresh baked Pillsbury® Breadsticks.